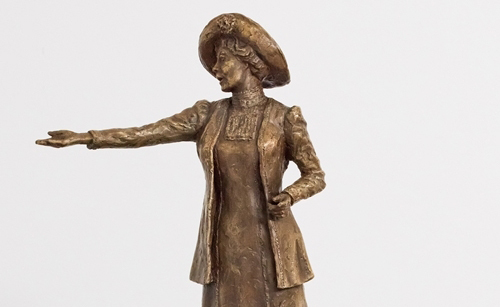 PHM is marking the centenary of the first women voting in a UK general election (14 December 1918) by celebrating the unveiling of a statue of Emmeline Pankhurst in St Peter’s Square, Manchester, known affectionately as ‘Our Emmeline’. Pop in to the museum and browse the shop at the earlier opening time of 9.30am and explore our exhibition Represent! Voices 100 Years On. Pick up your suffragette sash, rosette and poncho in the suffragette colours of purple, green and white from the museum, ahead of making your way to the march staring point on Great Northern Square at 11.15am to march to St Peter’s Square for the statue unveiling at 12.10pm. Visit The Left Bank cafe bar where suffragette specials, with a 20% discount for those wearing a sash or rosette, and cakes in the colours of the suffragette movement will be served throughout the day, with breakfast available from 8.00am. Enjoy a breakfast sandwich offer with a choice of hot drink (£4.45) before making your way to the march starting point and let your imagination wander back in time to the breakfast Mrs Pankhurst’s served more than 100 years ago to thank women released from prison for the sacrifices they had made. And a celebratory lunch, also in suffragette colours, will be available from 12.00pm to 2.00pm – choose from soup, stew or a sandwich from the daily specials menu, or Grab & Go anytime from a selection of freshly prepared sandwiches and cakes. This is a free drop event however we ask attendees to please book to help us make adequate provision. 6,000 ponchos are being provided by the Emmeline Pankhurst Statue Campaign, with a pick up point also at the Pankhurst Centre from where marchers will also be making their way to greet Our Emmeline in St Peter’s Square. Find out more about the Our Emmeline campaign and story.